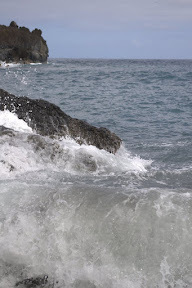 Mel and I just got back from Maui so I figured I would toss up all the latest happenings. Friday we flew out to Maui to spend the New Years with a friend of hers plus a few other days to explore Maui. It was hazy all weekend, apparently that happens when the winds blow the bog as they call it over from the Big Island. We spent New Years Eve on a beach at one of the Resorts with a friend of Brandon’s (Mel’s friend). It was one of the best, if not the best, New Years I’ve had. It was such a different thing to spend New Years on a beach instead of mushed together with a bunch of people like usual. 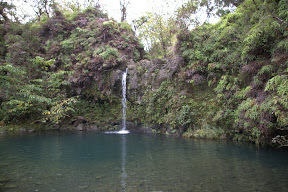 We stopped a few times on the way to Hana as there were some fun things to do. 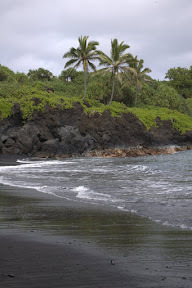 The first stop was at a black sand beach somewhere which was pretty cool. The next stop was at a waterfall that is pretty much what you see in the movies. 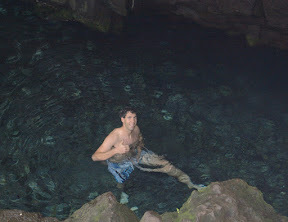 The waterfall was about 20 – 25 feet with a perfectly clear turquoise pool at the bottom. Brandon and some of the others walked up to the top and took the fast way down. I decided I didn’t want to get wet for this one so declined to jump. The next stop was at a park that had a normally underwater cave. A couple of us jumped in and explored the cave which was fun. 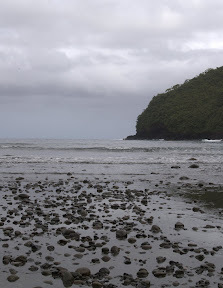 After that we stopped at another black sand beach that had a small cave over to the side that you could explore. While taking pictures a big wave came in that splashed me up to my chin which was exciting as I had to hold my camera way over my head so it didn’t get soaked. We jumped back in the trucks and headed back down the road and finally made it to Hana where we grabbed lunch and then hit the road again. Just down the road is a state park called 7 pools or something like that. Its basically a 60 foot waterfall going into a pool followed by another ~20 foot waterfall followed by smaller ones that compose 7 pools that eventually spill into the ocean. We all went swimming and this time I jumped off the ~20 foot waterfall. First time I’ve done that, really thinking staying on the ground is what I like. It wasn’t really scary but not really anything that I feel like I want to get into. Brandon and his friend Jeremy decided to jump off the 60 footer which everybody watched with excitement. After we got home Brandon fired up the grill and we all ate dinner which was awesome. Saturday we headed back down to the resort where Brandon’s friend Tom was staying at. It was Tom and his kid’s last day in Hawaii so we went to visit. I didn’t realize it, but the pool there was actually a series of pools all connected with water slides. Mel and I toodled around in the pools and then found the water elevator. Apparently the only water elevator like it in the world. Basically you go into the elevator into a basket. Then they close the door and fill the thing with water and the basket and you float to the top. That was really cool. After that we investigated the pool bar and grill. It was actually in the pool. You sit in chairs that are in the pool and they serve you which was really cool. Sunday we woke up at 5:30 and headed up the Mountain called Haliakela. Ya, I’m sure that isn’t even close, but the pronunciation is right. The peak is something like 10,500 feet so we were above the clouds to see the sunrise. We arrived about 15 minutes before the sun crested the horizon so I got a few shots. Its hard to photograph the sun without a filter so we took some pictures of reflections instead. After we got back Brandon’s girlfriend let us take her car for the day which was super nice. They were pretty beat from the work week and New Years so Mel and I got a day by ourselves. 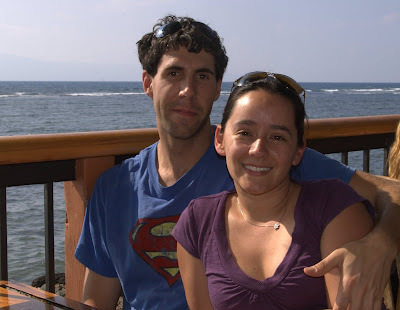 We headed over to Lahaina, which is the opposite direction on the island as Hana. 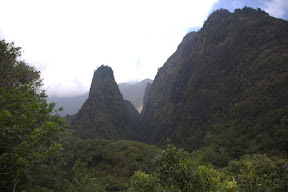 First, took me into this valley that was super pretty. 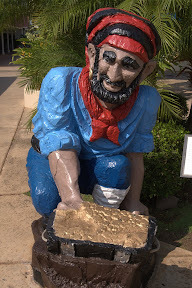 We made our way to Lahaina, which is a tourist town that has a board walk and lots of shops. We found an ornament for our trip at the open market thing. We walked all the way down the board walk and then found a place to grab a snack that was right on the beach. We like places like that. That pretty much wraps up the Maui trip. All I can say is THANK YOU to Brandon, Aubry, Max and Shaggy for letting us stay, driving us around all weekend and feeding us your wonderful cooking. Brandon will be an Iron Chef some day.